This image is groundbreaking for me in several ways. Firstly, up until that point, it was by far the longest integration I had got on any object. Integration is the term to describe the total duration of exposure that goes into a particular astronomical image. Different parts of the nebula glow in different wavelengths of light, depending on their composition. Using filters, you capture these wavelengths as separate mono images, then combine them in post-processing to forma colour image showing the composition of the object in different colours. Also looks very pretty :). 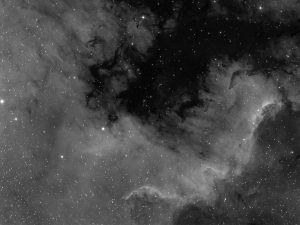 This particular image consisted of 2hrs 20min or Hydrogen Alpha capture, and 3hrs 15min of OIII data – all captured in 5-minute exposures (also known as ‘sub-frames’, or ‘Subs’). This gave a total integration time of5hrs 35min. These were also captured over two night – another first for me. Secondly, this is the first time I’ve ever captured dual-narrowband to make a bi-colour image. I combined the Ha and OIII in MaximDL, then post-processed in Photoshop CC and Lightroom CC. This process included a stage of combining the Ha image back into the colour image as a luminance layer, which helps to bring out the finer detail, as well as sharpening up the image as a whole, and reducing the noise. The first image above shows the Ha data alone, stretched and post-processed. I actually love Ha images in mono anyway, so even this I was very pleased with. 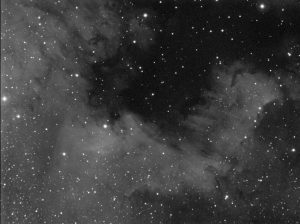 Ha tends to be the strongest source in most nebulae, and the Ha image makes a pleasing final result even if you don’t manage to grab anything else. The second image is the stretched OIII result. This final image here the image is far fainter, and much more noisy, due to requiring more stretching to make it bright enough to compete with the Ha. As the nebulae glow much fainter in OIII in general, the stretching of this makes the stars bigger. This is something that needs to be dealt with in post-processing, as having the stars bigger on one than the other, then overlaying them will cause the stars from one to peek out from behind the stars of the other, leaving us with funny-coloured halos. Post-Processing – Photoshop CC and Lightroom CC.